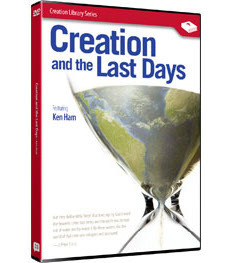 Creation and the Last Days by Ken Ham. Are we living in the ‘last days’? The great delusion of our age is evolution, and the idea of millions of years is key! In this candid presentation, Ken Ham shares a powerful message about our present age, especially considering the third chapter of 2nd Peter. Ham eemphasises that the Bible is a book of history, not just stories. In this video, the highly popular Christian apologist reveals the critical importance of time — millions and billions of years — to those who believe that the Bible is not accurate. “Millions of years” is a disease infesting the church, and it is key to the fulfilment of prophesies recorded in 2 Peter 3:3-10. Without the idea of millions of years, outspoken atheists and popular secular scientists would have a much harder time getting average schoolteachers and students to believe evolutionary explanations of; comets, spiral galaxies, DNA, natural selection, and the origin of life in general.